If you want to get an argument started about motorcycle oil, just ask a group of custom chopper owners whether synthetic or petroleum-based oil is best for their engines and then ask why motorcycle oil costs so much more. You'll find some very, very strong opinions on these issues. A while back, a Donny Petersen article appeared in American Iron magazine where he recommended synthetic oil for motorcycles. Harley-Davidson challenged his recommendations. Exxon Mobil then provided information about synthetic motorcycle oil and the advantages of the synthetics. There are clearly two strongly divided camps about this topic. For years, research results lauding the advantages of synthetics have been published. In fact, the Society of Automotive Engineers (SAE) has reported the benefits. Some of the benefits attributed to synthetic motorcycle oil products have been improved fuel economy, more power, less friction, better temperature control, increased engine life, less part failures and more. Sure, a car is not a custom chopper, but an engine is an engine - isn't it? Well, one significant difference between custom choppers and cars is that the chopper, at least in most cases, doesn't have a radiator and water coolant system to maintain engine temperature. 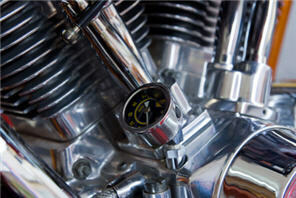 Most custom chopper power houses are cooled by the flow of air around the engine, dissipating the heat build up. The rear cylinder in a V-Twin engine will run hotter than the front cylinder as a result of this air cooling system. When the engine gets too hot, that is a bad thing. Yet, synthetic motorcycle oil producers and supporting research both indicate that synthetic oil helps keep the engine temperature down. Another question that begs to be answered is: What is so different about motorcycle engine oils than automobile engine oils? Why do we pay double, triple or even more for motorcycle oil to put in our custom chopper engines that we pay for the engine oil we put in our cars? Whether petroleum-based or synthetic, this price difference is always there.Of course, after investing our money and time into building or buying just the perfect custom chopper, no one wants to use the wrong product and damage the engine of our well-loved sleds. But then, I don't want to damage the engine of my classic Dodge Charger, either. Having to do a rebuild on either engine is not something I plan for the immediate future. So, if the motorcycle oil manufacturers are telling me the truth that motorcycle oil is so different and so much better than automotive motor oil and that synthetic oil shouldn't be used in my motorcycle, perhaps I should be using the more expensive motorcycle oil in my cage, right? Well, the bottom line is that custom choppers and cars are NOT the same and there are some differences in the oils that need to be considered. Let's look at these differences and then, you can determine for yourself whether to choose motorcycle-specific or automobile oil, petroleum-based or synthetic motorcycle oil in your custom chopper engine. Viscosity is one of the issues that are important when considering engine oil. But what, exactly, IS viscosity? According to John C. Woolum, PhD a Professor of Physics and motorcycle enthusiast who, in 1994, performed research on car vs. bike oils, defines viscosity as: "a measure of the friction between two layers of a liquid sliding relative to one another." Maintaining viscosity during the high operating temperatures and through the grueling transmission lubrication process is something that must occur to make an oil product effective for your chopper engine. Dr. Woolum that revealed that viscosity retention in automotive oils was frequently equal to, or even greater than, that for oil products labels as motorcycle oil. Other things that Dr. Woolum found during his research include the fact that synthetic oils experience a drop in viscosity more slowly than petroleum oils when used in the exact same ways. The largest drop in viscosity occurred during the first 800 miles or less of use. His research also indicated that motorcycles are, in fact, much harder on engine oil that automobiles. There was not a clear difference in his findings as to any ways that automobile oil was better than motorcycle oil, whether petroleum or synthetic. Friction modifiers are another issue. Cars benefit from friction modifiers. However, if you look at your custom chopper engine documentation, you will probably find a warning not to use any oil with graphite of molybdenum additives. This is because wet clutches clip when very low viscosity oil or oil with these additives is used. Read the label of any oil you put in your custom chopper and be sure it does not have these additives in large amounts. If your custom chopper engine handbook indicates that you should only use a specific oil, many are afraid that their warranty will be voided if they use any other product. The Magnusson-Moss Act says, simply put, that an original equipment manufacturer cannot base their warranty on making a consumer use an OEM part or fluid unless that part of fluid is provided to the consumer free of charge. So what's the real bottom line? The fact is that the choice is yours. There are very good automotive motor oils that some of my friends use in their custom choppers, while others wouldn't even THINK of putting something in their engines that didn't say clearly on the label that is was created specifically for motorcycles. Some of my friends are completely sold on the fact that synthetic motorcycle oil doesn't break down as quickly and wouldn't use anything else - in their motorcycles or their cars. Others choose to stick with the dinosaur oil. As long as you choose a top-of-the-line oil product that meets the specs for your engine, the choice is yours. The truth about engine oils for car or motorbike, is that you should never use oil for specific car on a motorcycle. In fact, the oil made for cars is very good for the bike's engine is nothing but good for the clutch system. Note that in the car are two types of oil used, one for the engine and another to the chest while on a motorcycle is used only one type of oil for the engine and clutch system, therefore, Adidas and has a structure made for this. We must also remember that there is an SAE for each type of vehicle...it's the minimum and maximum working temperature of the oil without losing its characteristics, depending on which it was developed for. For example, here in Brazil we usually use our motorcycles in a 4T-based mineral oil SAE 20W and 50, who works with both excellent viscosity at low temperature as high engine temperature. For example, the bikes that are marketed in very cold places, could not use the same oil that we in Brazil, because the oil would be hardened inside the engine because of its higher viscosity (made for warmer climates or tropical) in colder places should be used with oils at a lower viscosity, with SAE motor oil that is most appropriate for your area as instructed by SAE. EX SAE 10w40. What Are Your Questions, Comments, Or Suggestions Motorcycle Oil? Use synthetic oil to break in a motor?